REBLOC® vehicle restraint systems are reviewed and certified with real-life crash-tests according to the European standard EN1317 and significantly fulfill the prerequisites of modern vehicle restraint systems. All relevant containment levels from T1 to H4b are covered at the same time as achieving low working widths. Very high containment levels can also be accomplished in an economically efficient way. The integrated, innovative coupling together with the full-length steel tension bar and an ingenious reinforcement system ensures a high level of safety and an easy application. The individual elements form a high strength continuous chain that safely absorbs energy and impact forces. The coupling system features an interlocking design without any loose parts. Unauthorised removal of parts and installation errors are avoided as a result and a high level of protection against vandalism is ensured. REBLOC® concrete barriers are characterized by their quick and easy installation, which is possible in any weather at any time of the year. 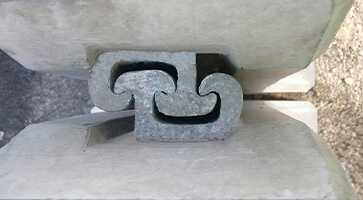 The symmetrical couplings enable you to install the elements from any side. 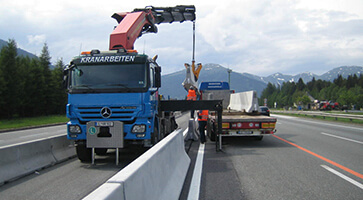 Additionally, it is possible to minimize logistics and therefore also the duration of road works. 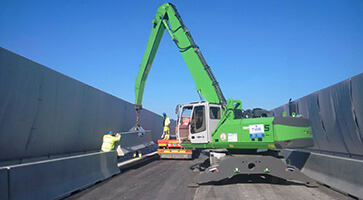 This allows faster resumption to normal traffic flow, which at once increases road safety. 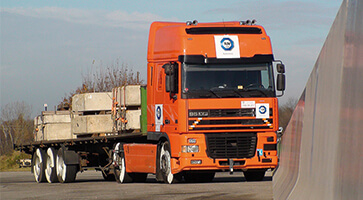 Every year, many kilometres of concrete elements are transported to each project. Cost-effective transport solutions are essential – regardless of whether it is by truck, rail or ship. A reduced number of loads saves time and money while minimising installation time and protecting the environment as well. Through our worldwide network of sales and production partners we are able to react fast and flexible. Transport distances are reduced and logistic efforts optimized. Your local contact person will make sure your project receives the best possible support. The system is extremely maintenance friendly because there are no loose parts and the couplings are integrated into the elements. However, if there is an accident, repairs and maintenance work may be needed. For this purpose, individual elements can simply be lifted out at any point along the continuous chain and then slotted back in again. Only top quality concrete elements are allowed to leave our production plants. This is ensured on the one hand on the usage of high quality raw materials, and on the other on a carefully recorded, high-quality assuring manufacturing process. 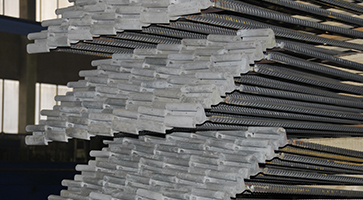 The production of our precast concrete elements is CE approved and is therefore subject to the highest quality criteria. The requirements of European standard EN1317-5 are stringently adhered to with continuous supervision through audits and quality checks. REBLOC® systems protect the environment. 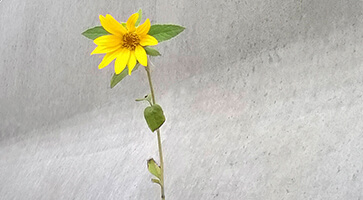 Concrete is a pure natural material consisting of gravel, sand, cement and water. Their long life expectancy contributes significantly to a positive environmental balance.